» Hey everyone! We are Post-Modern Connection. » Post your own TGA covers here. Exclusive Q&A with Brian - Round 4! SLEEPWALKERS edition. We have done it 3 times already and now we are going to kick off the 4t edition of the exclusive Q&A with Brian. With the release of Sleepwalkers coming up soon, Brian is excited to hear your questions! Want to complain about the forum? Don't like the font? Annoyed that your post got edited or that a whole thread got deleted? Think the Admins are a bunch of wannabe dictators? Here is the thread to air your complaints and to make constructive criticism (and we might even reply). Go on, we can take it.
? ideas for competitions ? Having just run two successful competitions for an intimate gig in the UK, and having previously run one for an instore gig in the US, we are hoping to bring you more competitioosn in future (there is a US summer tour coming up). So, if you have any good ideas for competitions, assuming Brian doesn't come up with another one himself, let us know what we could do. You are bidding on 2 tickets to see Brian Fallon at Crossroads in Garwood, NJ on Friday, December 4th. 100% of the proceeds from this auction go directly to providing programs for the youth at the Boys & Girls Club of Buena Park. Auction ends Thursday, August 20th at 1:00PM EST. 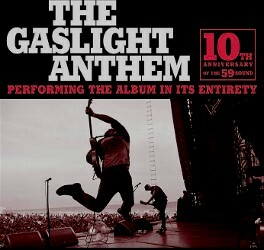 171 of you took part in our poll to find the top 25 Gaslight songs. Thank you all for your participation and your votes. The poll closed yesterday and [*drum roll*] the results are already in! >> The '59 Sound had quite an endspurt. Only a few days ago The Backseat and Great Expectations were still in the lead.